These improvements and new features will make it easier to swiftly correct administrative mistakes, kick off funnels, and get down to business faster. This feature was working fine, but the UI did not display correctly the progress of the import. Causing users t leave the page before the import was complete, therefore preemptively terminating the process. We’ve fixed the UI and made it more obvious what’s actually going on during the import process. This feature is brand new and allows you to bulk delete contacts based on tags. Keep in mind that this is a check merely if a contact has ANY of the given tags. This is also a new feature which was requested by several users, but in truth it’s lack of implementation was an oversight. There are two was you can add contacts to a funnel. From the contact record find the Actions section. Select a step from the dropdown. Click Start. When in the funnel editor there is a new button in the top editing bar which reads Add Contacts. Click it and a popup will appear. 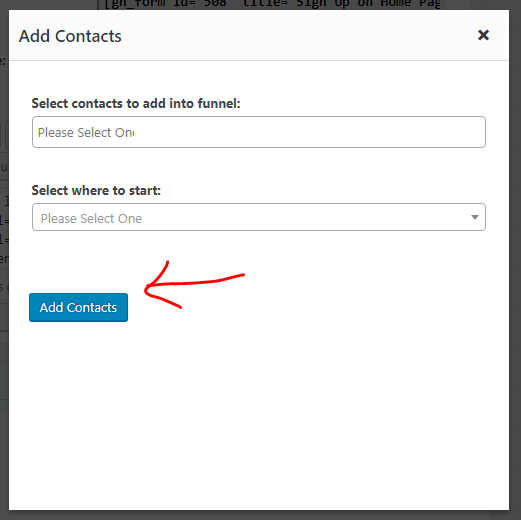 Select tags which belong to the contacts you wish to enter into the funnel then select at which step to add them.